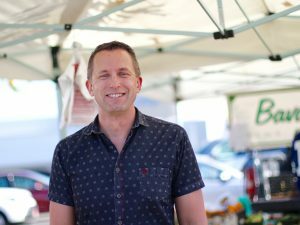 Allen J. Moy is Executive Director of the Pacific Coast Farmers’ Market Association (PCFMA), a nonprofit organization which serves over 300 California farmers by operating and promoting more than 50 certified farmers’ markets in the San Francisco Bay Area. Allen joined PCFMA in 2003, bringing over 15 years of experience in nonprofit organizations. Allen is a Board member of Fresh Approach, a nonprofit organization founded by PCFMA in 2008 that connects California communities with healthy food from California farmers through innovative health, nutrition and food access programs such as VeggieRx, Market Match and the Freshest Cargo Mobile Farmers’ Market. Allen is a native of San Antonio, Texas. He holds a Master’s in Urban Administration and a Bachelor’s in Communications and Political Science, both from Trinity University in San Antonio. Allen also has a Certificate in Human Resource Manager from California State University, Hayward (now Cal State East Bay). “The most immediate threat that I see to farmers’ markets nationwide is the proposed elimination of federal funding for the Farmers’ Market Promotion Program, Local Food Promotion Program, Specialty Crop Block Grant program and WIC Farmers’ Market Nutrition Program. The combination of these cuts would be devastating to the farmers’ market industry by simultaneously eliminating funds that farmers’ markets use to innovate while also eliminating the only designated funding support for farmers’ market customers. Another significant obstacle that farmers’ markets in California is seeing is an increase in regulation and regulatory fees from multiple levels of government. In California we are seeing increases in fees charged by county Agriculture Departments and Environmental Health Departments along with new fees from fire districts. In addition to permitting costs, each of these governmental entities also charges fees for regular inspections. We are also seeing new user fees from city governments for access to public spaces such as streets, parks and plazas that were previously provided for free as a part of a local commitment to community service. I have heard anecdotally from colleagues in other states of similar challenges. “I am a Board member of Fresh Approach, a nonprofit organization that works in partnership with the Pacific Coast Farmers’ Market Association to help increase access to fresh, locally-grown fruits and vegetables while supporting opportunities for local small farms. I previously served as the Executive Director of Fresh Approach from 2011 to 2015. I am a Board member and Treasurer of the California Small Farm Conference. The California Small Farm Conference is a nonprofit organization that organizes an annual educational conference for California’s small scale direct marketing farmers and the state’s certified farmers’ market managers. I previously served as the President of the California Small Farm Conference Board of Directors from 2006 to 2010.